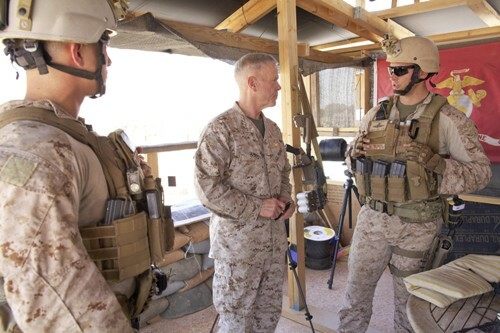 The Marine Corps has reached a transition point in Libya, replacing reserve Marines who had protecting the U.S. embassy compound in the capital city of Tripoli with active-duty forces from Camp Lejeune, N.C., officials said. The reserve Marines were with Special Purpose Marine Air Ground Task Force-Africa, a unit established in 2011 primarily to train friendly military forces in the region. Its home base is Naval Air Station Sigonella, Italy. The last iteration of SPMAGTF-Africa deployed in January, and send a reinforced platoon to protect the embassy, the unit’s commander, Lt. Col. Daniel Whisnant, told Marine Corps Times in March. The Marines at the embassy were known as Task Force Tripoli. The Marines in SPMAGTF-Africa redeployed to the U.S. recently, and the follow-on mission will not have the same mission. Instead, Marines from II Marine Expeditionary Force, out of Camp Lejeune, N.C., will protect the embassy and “continue to provide interim security for U.S. government personnel and assets under the director of Marine Corps Forces Africa, U.S. Africa Command and in coordination with the U.S. Department of State,” said 2nd Lt. Tatiana Zappardino, a spokeswoman for the latest iteration of SPMAGTF-Africa. SPMAGTF-Africa will continue to advise and train with African militaries that have friendly relations with the U.S. It has teams deploying this month to Uganda and Burundi, nations in which Marines have deployed repeatedly in recent years to train African troops. Marines from the Corps’ new crisis-response force were sent to Libya last month to reinforce the embassy, as unrest their mounted, Commandant Gen. Jim Amos told reporters late last month at a breakfast meeting in Washington. Amos said about 87 Marines were sent there for the mission, and visited the facility on June 16 as part of a tour of U.S. installations abroad. The 550-Marine crisis-response force deployed in April, and is now split between Morón Air Base in Spain and Naval Air Station Sigonella in Italy, putting elements of it as close to northern Africa as possible without being on the ground there. The force initially was put in Spain, but staged in Sigonella in May when the security situation in Libya took a turn for the worst. Amos said when he visited the force in June, it was on an alert status in which they had to be wheels up to respond to any crisis within six hours. The force also have been on an even more heightened alert status in which they would have to leave within an hour if necessary, the commandant said. Too bad they didn’t call the shots in Afghanistan & Iraq! Don’t worry, history tends to repeat itself. I’m sure they have all the chances to “call the shots” in the whole region of Middle East and North Africa. So now the embassy in Tripoli is guarded by 87 Marines plus contract guards plus the Diplomatic Security Service because “the situation has deteriorated”? I thought Obama, Clinton and Kerry had everything under control there! Your understanding of the situation on the ground is severely flawed, as is your oversimplification of the militia and Libyan government allegiances. The group that killed Ambassador Stevens was not an “anti-Gadhafi militia” but a Salafist terror group aligned with Al-Qaeda, and their reasons are far more overt than your oil company conspiracy. Simply put, our commanders are fighting for the right side, OUR side. They have absolutely nothing to do with anything involving the Libyan government or picking sides with the militias. The Marines are there for one reason and one reason only: to protect Americans who are working the diplomatic mission. Period.